At Monticello, beer and cider were served during dinner, and wine was served after the meal. 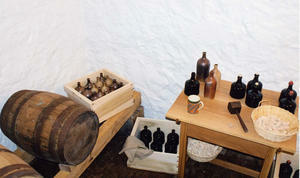 Jefferson's earliest designs for Monticello included spaces for brewing and the storage of beer. Initially, Jefferson's wife Martha was responsible for brewing at Monticello. In 1772, she recorded the brewing of a fifteen-gallon cask of "small" beer, a low-alcohol beer meant for quick consumption. For the thirty years following Martha's death in 1782, there is no record of brewing on the plantation. In 1813 Jefferson arranged for Captain Joseph Miller, a brewmaster and British citizen who became trapped in the U.S. during the War of 1812, to teach Monticello's former cook, Peter Hemings, how to malt grain and brew beer. Following Miller's departure, Hemings oversaw the brewing operations, making one hundred gallons of ale every spring and fall. Dimensions 12' - 2" x 16' x 10"; ceiling 9' - 11"